Our first trimester of school has come to an end. That always signals the beginning of “hectic season”. Those weeks from Thanksgiving until winter break are always so busy. It’s tough to fit everything in. PLUS the kiddos are ready for that break. Fitting in our social studies standards regarding customs and traditions during this holiday time couldn’t be more perfect. It keeps them engaged. No reason to try to divert their minds from where it is already wandering… it’s time to embrace the holidays and holiday customs around the world. I love helping the kiddos learn that many of the holiday traditions their families practice actually began a long, long time ago in another part of the world. We have a great time learning about old traditions and how they’ve changed over the years while drawing comparisons to things we do in our own homes. I begin the entire unit with a little interactive reader about holiday customs. All of the different cultures we discuss keep us very busy and the time seriously flies by! Before we discuss traditions that have come from Germany and the good ol’ tannenbaum, I send a note home to parents letting them know that we are discussing family and holiday traditions in class. I ask them to talk about a few of their family’s favorite traditions so the kids will have some ideas to write about when they get to class. I love reading about what they most enjoy doing with their families. Throughout these weeks we play a lot of games. MOSTLY it is because they are very active and need to move! Making these dreidels and writing the game instructions are a great way to introduce a new game to play AND create an expository writing piece! I love Tomie dePaola’s Legend books. This one about the Poinsettia is very beautiful. I bring in a few poinsettia’s to decorate the room, too! I use the Legend of the Poinsettia as a lead in to our poinsettia project. This is not only gorgeous on the walls as part of our bulletin board, it is also a gift for parents. With this project the kids write a heartfelt note to their parents, roll it up like a scroll and attach it to the back of the poinsettia. The whole thing is a perfect tree ornament. A previous parent, whose children I taught well over 10 years ago, contacts me every year as she decorates her tree to thank me for the gift. It’s the note. My secret is I tell the kiddos the goal is to “make em cry” with joy. Make them sob, “I have the sweetest, best, most incredible kid in the whole world!” Tell them all of the reasons they are important to you. Most spend a lot of time making this special assignment absolutely perfect. Most of my kiddos are very familiar with hanging stockings for Santa Claus to fill and leaving out treats for Santa to eat. They are thrilled to learn about the tradition of leaving out wooden shoes for Sinter Klaas – filled with treats for his white horse to eat! They come up with some pretty amazing things they’d like to find in those wooden shoes in place of the carrots and hay! In honor of Sweden’s St. Lucia, we talk about serving breakfast to our parents. Although we work a little bit of traditions and culture into this lesson, it is also a fabulous writing assignment. The kids LOVE talking about the food THEY would want to serve so they are always very engaged in getting their paragraph just right. This little mouse is my absolute FAVORITE bulletin board item. It’s so simple and cute. They always turn out adorable. I also love the writing we do with it. After sharing the poem, ‘Twas the Night Before Christmas with them, we discuss how exciting it is to anticipate something, how it can be difficult to sleep and how sometimes we dream some pretty amazing things. Then I have them write about what one of those amazing dreams might be. The creativity they express on these little pages is fabulous. In the Holiday Customs Around the World resource, I included a large bulletin board header, too. I LOVE this cutie!! 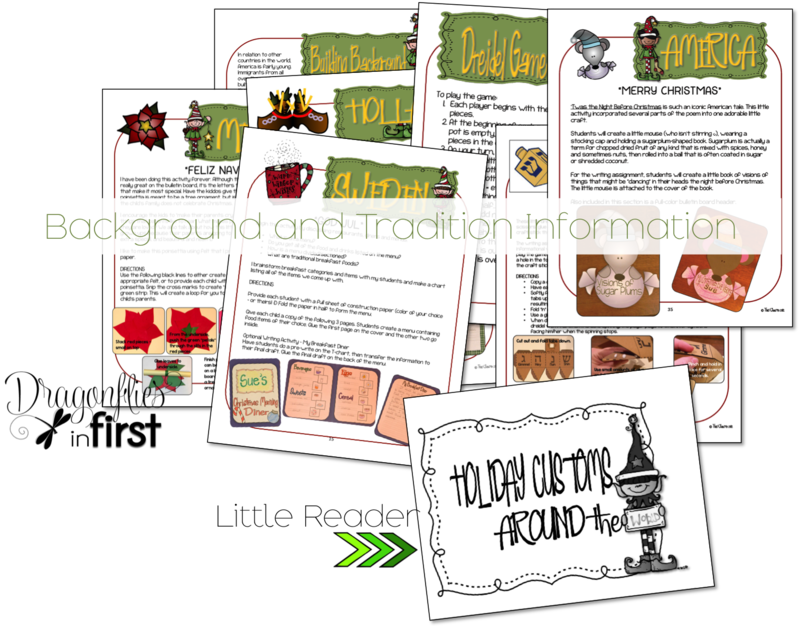 I’m excited to begin this Holiday Customs Around the World unit with this group! They are so sweet and “celebrating” is definitely their wheelhouse. They will have a blast! 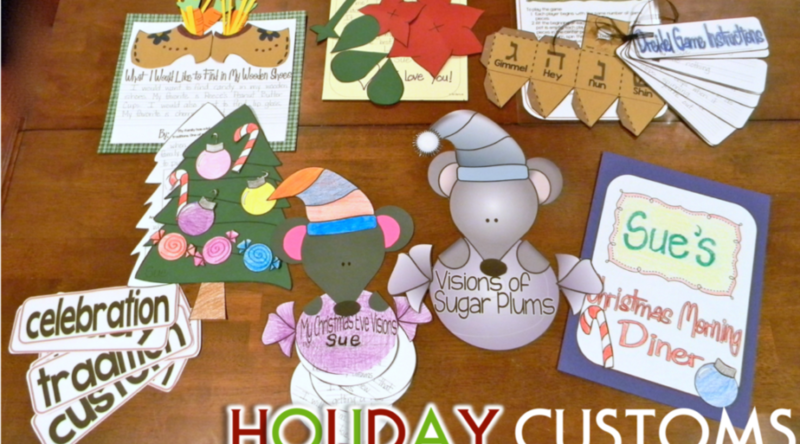 You can find Holiday Customs Around the World in my TpT store.